Peel whole pears, leaving the stems intact. Cut a thin slice from the bottom of each pear so the pears stand up. Working through the bottom of each pear, use a melon baller to remove the core. In a small mixing bowl, combine cranberries, walnuts, lemon juice, and sugar. Spoon mixture into bottom of each pear. Stand pears in a 2-quart square baking dish. Add water to baking dish. Pour maple syrup over and around pears. Sprinkle any remaining filling into bottom of dish. Bake, covered, in 350 degree F oven for 20 minutes. 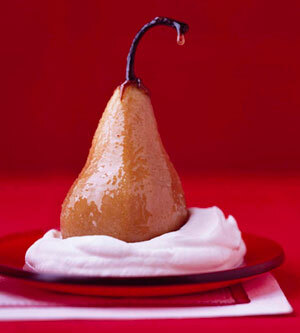 Uncover; bake for 20 to 25 minutes more or until pears are tender, basting occasionally with cooking liquid. To serve, spoon whipped cream in the center of 4 dessert plates. Place pears in cream. Spoon any remaining cooking liquid over pears. If you like, garnish with a few slices of strawberries and mint leaves. Serve warm. Makes 4 servings. In a chilled mixing bowl combine whipping cream, sugar, and vanilla. Beat with an electric mixer on medium speed until soft peaks form (tips curl).